Product Features A unique artistically designed outlined illustration of the breed. Our highest quality 10 oz. cotton twill tote bag material. 16.5"h x 15.5"w x 7"d and 21 inch straps mean you can fit all of the goodies from your farmer's market trip into one bag. 21" straps allow for a comfortable carry and easy access to contents inside the tote bag. A carrying capacity that easily exceeds 35 lb's. Washing machine and dryer safe! 100% Satisfaction Guarantee! We are a small woman owned business and we stand behind our products. If you are not satisfied we will gladly refund your purchase. The Outline Style Doberman Pinscher Dog 10 oz. cotton twill tote bag is the perfect gift for the Doberman Pinscher or dog lover in your life. These tote bags are handmade from the highest quality 10 oz. 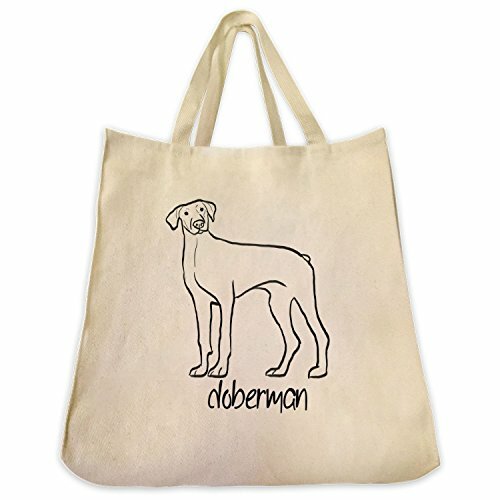 cotton twill and feature the Doberman breed as an outline illustrated style design on the front of your tote. Personalization with a name & a paw print is included FREE with any purchase! 10% of every product purchased on ToteTails.com goes directly to benefit the SPCA, Humane Society and other animal welfare organizations.